The Fourth Doctor and Romana find themselves going underground when the TARDIS lands them under the crust of an alien world. But they soon find themselves being swallowed up by giant burrowing machine. Along with the relatively harmless locals, something else is stirring. Something that feeds on the drill-towns. Something that is relentless and will not stop. The Silex are coming and they are on the hunt. 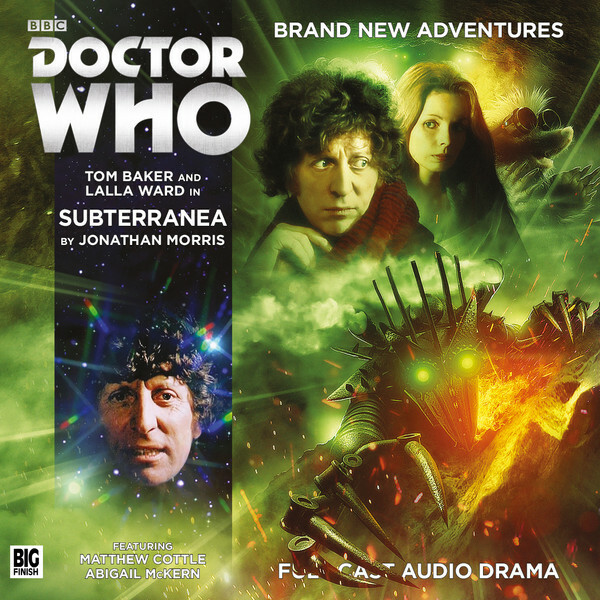 Listening to Subterranea, you would be pardoned for mistakenly thinking your listening to a weird steampunk version of Wind in the Willows with some David Copperfield thrown in for good measure! It is good then that author Jonathan Morris later explains that he took a lot of inspiration from Copperfield in the extras. And I am also glad that Morris decided to focus on the more whimsical side for this story, otherwise it would have fallen completely flat. If we had to listen to another story about robots converting people, you would undoubtedly be listening to a Cyberman story. Instead, Subterranea gives us another cybernetic race and as a result, this story gets off to a bit of a boring start until the actors start to throw in their character beats and I was reminded that these are little mole people with googles on.